Can You REALLY Add 10 MPH of Club Speed (and 30 Extra Yards to Your Drives) INSTANTLY with Just a Few Uses of This Device? You don’t need hours of range time. All you need is this incredible breakthrough in golf distance technology — and in no time, you can be BOOMING it farther than anyone in your foursome! Save 10% — While Supplies Last! If you’re like many golfers out there, you’re tired of being the shortest hitter of your group. All the other guys (including that smarmy one you can’t stand) consistently pound it WAY past you, round after round, year after year. And it’s driving you absolutely bonkers. Sure, they try to be nice by saying things like “wind must have knocked that one down” or “you’ll get it next time”. It’s time to make a change…to finally gain some much-needed respect and credibility with your playing partners…and add some serious (and I mean SERIOUS) distance to your game. Just a Few Uses Gets You an Extra 21‑30 Yards on Your Next Drive. This amazing new golf improvement product literally adds 7‑10 MPH of clubhead speed, translating to as much as 30 yards of extra distance on your next drive. While the SuperSpeed System weighs the same as a standard golf club, but with the specially weighted heads, you can swing the SuperSpeed System more than 25 miles per hour faster than your own driver. This ultra-quick swinging motion automatically activates the fast twitch muscle fibers through the “Overspeed Training Effect”, the same type used by Olympic sprinters as they train to compete for the gold medal. These fast twitch muscles normally lie dormant in your current swing. But with the SuperSpeed System, you’ll tap into the wellspring and bring these power-dripping muscles to life, gaining significantly more distance on your tee shots and putting your pals to shame. Develop a routine of swinging the SuperSpeed System at these higher speeds on a regular basis and you will continue to increase your swing speed and promote the proper mechanics. Just follow the included training protocol videos and continue adding yardage on your tee shots that will stick permanantly. What Exactly is Overspeed Training? “Superspeed has changed the way I play golf. I’ve had a permanent increase of 10mph with the club head speed with my driver! I am not only closer to the green from the tee but at least an iron longer. I’ve been able to see a massive improvement in my long irons with the extra club head speed producing a higher stronger flight. “I have long been aware of the benefit of playing different sports on both sides of the body and the effect on power generation in the golf swing. I began implementing protocols based on both sides of the body with both my amateur and professional players with great results. So I was particularly pleased to see the introduction of a specifically designed speed set by Superspeed Golf. — Mark J. Smith, Ph.D.
Because we’re not only slashing the price by 10%, we’re also throwing in 3 special bonuses absolutely FREE to help sweeten the deal. Don’t know where to start with your SuperSpeed System? No problem — we can help! Your order includes 6 in-depth protocol videos on exactly how to use your SuperSpeed System for maximum effectiveness. In just a few minutes, the introduction protocol will show you how to get the most out of your training exercise. As you gain more and more power, you’ll move up to the second, third, and advanced levels until you’ve reached absolute peak physical performance. This video training series will give you a detailed plan for years of power development training. These convenient digital exercise guides give you a quick reference for each level of your SuperSpeed Training Protocol. Download these guides to your phone or print them out at home for a complete walkthrough of your training - any time you need it. And you'll get instant access to the full digital training guides and video training series, so you'll be ready to start your SuperSpeed training as soon as your shipment arrives. We all know eating the right foods not only helps you maintain your overall health, make you feel better, and look better, but it can also improve your performance on the golf course. 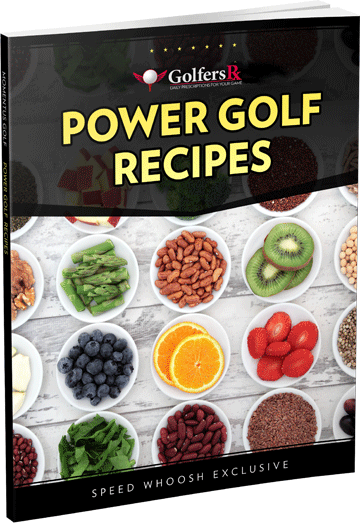 These recipes contain our favorite foods to jump-start your golf game, keep you at peak performance during your round—as well as post round recovery recipes. And it’s included as part of your instant access package—FREE with your order during this special promotional period. And, if after those 30 days, you’re not satisfied in any way with the SuperSpeed System or the bonuses, and you’re not seeing a 7-10 MPH increase in your swing speed, and you’re not getting 21-30 additional yards on your drives, then simply let us know and we’ll arrange to have you return it for a full refund of the purchase price (minus shipping and handling). No asterisks. No fine print. Just a set-in-stone promise, direct from the founder. You don’t get results, you don’t pay. Can you imagine the looks on their faces when they see your ball sailing past theirs in the fairway…they’ll be scrambling to your bag, desperately trying to find your “secret weapon”! Don’t let this opportunity pass you by. You CAN be one of the biggest hitters in your group, and start playing the kind of golf you’ve always wanted to, with better scores and more fun. And the SuperSpeed System can help you quickly and easily get there. But you gotta grab this deal NOW before the clock runs out. Because when we hit our discount limit, this page will disappear forever — along with this tremendous savings. So go ahead — choose your SuperSpeed System by clicking the button below and let’s get started! GolfersRx Exclusive Discount · lowest price anywhere! For players who play a standard weight men’s driver with an overall weight between 300 and 325 grams. For players who play a lightweight driver with an overall weight between 275 and 305 grams. For players who play a standard weight men’s driver with an overall weight between 275 and 300 grams.